"Sealth" redirects here. For the ferry, see MV Sealth. For the camp, see Camp Sealth. Chief Seattle (c. 1786 – June 7, 1866) was a Suquamish and Duwamish chief. A leading figure among his people, he pursued a path of accommodation to white settlers, forming a personal relationship with "Doc" Maynard. The city of Seattle, in the U.S. state of Washington, was named after him. A widely publicized speech arguing in favor of ecological responsibility and respect of Native Americans' land rights had been attributed to him; however what he actually said has been lost through translation and rewriting. On or near Blake Island, Washington, U.S. The name Seattle is an Anglicization of the modern Duwamish conventional spelling Si'ahl, equivalent to the modern Lushootseed spelling siʔaɫ IPA: [ˈsiʔaːɬ]. He is also known as Sealth, Seathle, Seathl, or See-ahth. Seattle's mother Sholeetsa was Dkhw'Duw'Absh (Duwamish) and his father Shweabe was chief of the Dkhw'Suqw'Absh (the Suquamish tribe). Seattle was born some time between 1780 and 1786 on or near Blake Island, Washington. One source cites his mother's name as Wood-sho-lit-sa. The Duwamish tradition is that Seattle was born at his mother's village of Stukw on the Black River, in what is now the city of Kent, Washington, and that Seattle grew up speaking both the Duwamish and Suquamish dialects of Lushootseed. Because Native descent among the Salish peoples was not solely patrilineal, Seattle inherited his position as chief of the Duwamish Tribe from his maternal uncle. Seattle earned his reputation at a young age as a leader and a warrior, ambushing and defeating groups of tribal enemy raiders coming up the Green River from the Cascade foothills. In 1847 he helped lead a Suquamish attack upon the Chimakum people near Port Townsend, which effectively wiped out the Chimakum. Like many of his contemporaries, he owned slaves captured during his raids. He was tall and broad, standing nearly six feet tall; Hudson's Bay Company traders gave him the nickname Le Gros (The Big Guy). He was also known as an orator; and when he addressed an audience, his voice is said to have carried from his camp to the Stevens Hotel at First and Marion, a distance of 3⁄4 mile (1.2 km). Chief Seattle took wives from the village of Tola'ltu just southeast of Duwamish Head on Elliott Bay (now part of West Seattle). His first wife La-Dalia died after bearing a daughter. He had three sons and four daughters with his second wife, Olahl. The most famous of his children was his first, Kikisoblu or Princess Angeline. Seattle was converted to Christianity by French missionaries, and was baptized in the Roman Catholic Church, with the baptismal name Noah, probably in 1848 near Olympia, Washington. For all his skill, Seattle was gradually losing ground to the more powerful Patkanim of the Snohomish when white settlers started showing up in force around 1850. (In later years, Seattle claimed to have seen the ships of the Vancouver Expedition as they explored Puget Sound in 1792.) When his people were driven from their traditional clamming grounds, Seattle met Doc Maynard in Olympia; they formed a friendly relationship useful to both. Persuading the settlers at the white settlement of Duwamps to rename their town Seattle, Maynard established their support for Chief Seattle's people and negotiated relatively peaceful relations with the tribes. Seattle kept his people out of the Battle of Seattle in 1856. Afterwards, he was unwilling to lead his tribe to the reservation established, since mixing Duwamish and Snohomish was likely to lead to bloodshed. Maynard persuaded the government of the necessity of allowing Seattle to remove to his father's longhouse on Agate Passage, 'Old Man House' or Tsu-suc-cub. Seattle frequented the town named after him, and had his photograph taken by E. M. Sammis in 1865. He died June 7, 1866, on the Suquamish reservation at Port Madison, Washington. The speech or "letter" attributed to Chief Seattle has been widely cited as a "powerful, bittersweet plea for respect of Native American rights and environmental values". But this document, which has achieved widespread fame thanks to its promotion in the environmental movement, is of doubtful authenticity. The evolution of the text of Chief Seattle's speech, from a flowery Victorian paean to peace and territorial integrity, into a much briefer environmentalist credo, has been chronicled by several historians. The first attempt to reconstruct this history was a 1985 essay in the U.S. National Archives' Prologue magazine. A more scholarly essay by a German anthropologist followed in 1987. In 1989, a radio documentary by Daniel and Patricia Miller resulted in the uncovering of no fewer than 86 versions of Chief Seattle's speech. This then prompted a new discussion, first in the Seattle Weekly and then in Newsweek. The historian Albert Furtwangler then undertook to analyze the evolution of Chief Seattle's speech in a full-length book, Answering Chief Seattle (1997). More recently, Eli Gifford has written another full-length book, The Many Speeches of Chief Seattle (2015), which assembles further elements of the story, gives accurate transcriptions of 11 versions of the speech, and explores possible motivations for manipulating the words in each case. The oldest extant record of this document is a transcript published in the Seattle Sunday Star in 1887, in a column by Henry A. Smith, a poet, doctor, and early white settler of the Seattle area. Smith provides a transcript of a speech made by Chief Seattle 30 years earlier, which Smith had attended and taken notes from. The occasion of the speech was a visit by the newly appointed Governor, Isaac Stevens. The governor's visit to a council of local tribal chiefs that year is corroborated by the historical record. Chief Seattle was the most influential chief in the area, so it is likely he would have been in attendance. However the date, the location, and the actual words of Chief Seattle's speech are disputed. For instance, Smith's article in the Seattle Sunday Star claims that the purpose of Governor Stevens's meeting was to discuss the surrender or sale of the Indians' land to white settlers — but there is no record to support that this was the purpose of Stevens's visit; in fact, the purpose of the visit seems to have been to investigate lands already considered to belong to the United States. Moreover, contemporary witnesses do not place Smith at the 1854 meeting. There is a written record of a later meeting between Governor Stevens and Chief Seattle, taken by government interpreters at the Point Elliott Treaty signing on January 22, 1855. But the proceedings of this meeting bear no resemblance to the reminiscence that Dr. Smith recorded in 1887. According to Smith's recollection, Doc Maynard introduced Governor Stevens, who then briefly explained his mission, which was already well understood by all present. Chief Seattle then rose to speak. He rested his hand upon the head of the much smaller Stevens, and declaimed with great dignity for an extended period. And Smith then presents a detailed translation of the speech. But recent scholarship questions the authenticity of Smith's version of the speech. Chief Seattle most probably spoke in the Lushootseed language, and someone then translated his words into Chinook Jargon, a limited trading language, that a third person then translated into English. But Smith's English version is in a flowery Victorian prose, and Smith noted that he had recorded "but a fragment of his [Seattle's] speech". Moreover, Smith's version of the speech does not square with the recollections of other witnesses; and as we have seen, Smith himself may not have been present as a witness. As a result of such discrepancies, staff of the National Archives in Washington, DC, concluded that the speech is most likely fiction. However, a spokesperson for the Suquamish Nation has said that according to their traditions, Dr. Smith consulted the tribal elders numerous times before publishing his transcript of the speech in 1887. The elders apparently saw the notes Dr. Smith took while listening to the speech. The elders' approval of Smith's transcript, if real, would give that version the status of an authentic version. Smith's notes are no longer extant. They may have been lost in the Great Seattle Fire, when Smith's office burned down. Why, however, did Smith wait thirty years to publish his transcript of the speech? It seems most likely that Smith's reason for publishing the speech was political. Newly arrived immigrants were starting to overpower the original pioneers who had dominated local politics. There was a bitterly contested election, with one newspaper claiming these new immigrants wanted "the overthrow of our institutions, ... rob you ... of home, of country and of religion." When Smith had Chief Seattle waxing rhetorical about the demise of the native peoples, was he also talking about the demise of the original pioneers who found themselves denounced as "obstacles in the way of progress," as "old mossbacks", with some even calling for their hanging? The first few subsequent versions can be briefly enumerated: in 1891, Frederick James Grant's History of Seattle, Washington reprinted Smith's version. In 1929, Clarence B. Bagley's History of King County, Washington reprinted Grant's version with some additions. In 1931, Roberta Frye Watt reprinted Bagley's version in her memoir, Four Wagons West. That same year, John M. Rich used the Bagley text in a popular pamphlet, Chief Seattle's Unanswered Challenge. In the late 1960s, a new era dawned in the fame of the speech and in its further modification. This began with a series of articles by William Arrowsmith, a professor at the University of Texas, which revived interest in Seattle's speech. Arrowsmith had come across the speech in a collection of essays by the President of Washington State University. At the end of one of the essays, there were some quotes from Smith's version of Chief Seattle's speech. Arrowsmith said it read like prose from the Greek poet Pindar. With interest aroused, he found the original source. After reading it, he decided to try improving Smith's version of the speech, by removing Victorian influences. Arrowsmith attempted to get a sense of how Chief Seattle might have spoken, and to establish some "likely perimeters of the language." But the massive fame of Chief Seattle's speech is probably due to a poster printed in 1972, which shows a picture of Chief Seattle overlaid with words from his "letter" to "the president in Washington". The words are in fact taken from Arrowsmith's version of the speech, but with further modifications such as the image of shooting buffalo from trains, and the line "The earth does not belong to man; man belongs to the earth." The poster was made to promote a movie called Home, an environmentalist movie produced for the Southern Baptist Radio and Television Commission. The movie's producer wanted to show a distinguished American Indian chief delivering a statement of concern for the environment, so the script writer, Ted Perry, wove together environmentalist rhetoric with pieces of Chief Seattle's speech in the Arrowsmith version. But Perry was not credited with this because, according to Perry, the producer thought the movie would seem more authentic if the text was attributed directly to Chief Seattle himself and not to a screenwriter. I first heard a version of the text read by William Arrowsmith at the first Environmental Day celebration in 1970. I was there and heard him. He was a close friend. Arrowsmith's version hinted at how difficult it was for Seattle to understand the white man's attitude toward land, water, air, and animals. For the soundtrack for a documentary I had already proposed about the environment, I decided to write a new version, elaborating on and heightening what was hinted at in Arrowsmith's text ... While it would be easy to hide behind the producer's decision, without my permission, to delete my "Written by" credit when the film was finished and aired on television, the real problem is that I should not have used the name of an actual human being, Chief Seattle. That I could put words into the mouth of someone I did not know, particularly a Native American, is pure hubris if not racist. While there has been some progress in our knowledge of Native Americans, we really know very little. What we think we know is mediated by films, chance encounters, words, images and other stereotypes. They serve our worldview but they are not true. I edited the speech to fit our needs [Baptists] more closely. There was no apple pie and motherhood and so I added the references to God and I am a savage to make the Radio and Television Commission happy ... I had edited scripts that did not have the Baptists' line dozens of times. This needed to be done so they could justify spending thousands of dollars on a film ... I eventually quit my job as a producer because I got tired of shoehorning those interests into scripts. The version of Chief Seattle's speech edited by Stevens was then made into a poster and 18,000 copies were sent out as a promotion for the movie. The movie itself sank without a trace, but this newest and most fictional version of Chief Seattle's speech became the most widely known, as it became disseminated within the environmentalist movement of the 1970s — now in the form of a "letter to the President" (see below). A similar controversy surrounds a purported 1855 letter from Seattle to President Franklin Pierce, which has never been located and, based on internal evidence, is described by historian Jerry L. Clark as "an unhistorical artifact of someone's fertile literary imagination". It seems that the "letter" surfaced within environmentalist literature in the 1970s, as a slightly altered form of the Perry/Stevens version. The first environmental version was published in the November 11, 1972 issue of Environmental Action magazine. By this time it was no longer billed as a speech, but as a letter from Chief Seattle to President Pierce. The editor of Environmental Action had picked it up from Dale Jones, who was the Northwest Representative of the group Friends of the Earth. Jones himself has since said that he "first saw the letter in September 1972 in a now out of business Native American tabloid newspaper." Here all leads end, but it is safe to assume the original source was the movie poster. There is no record of a letter from Chief Seattle in either the private papers of President Pierce in the New Hampshire Historical Society, or in the Presidential Papers of Pierce in the Library of Congress. The staff at the National Archives has been unable to locate any such letter among the records of the Bureau of Indian Affairs in the National Archives and "concluded that the letter ... is probably spurious." 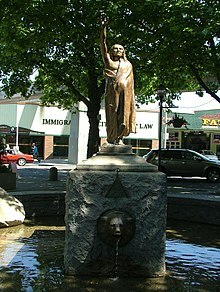 Statue (erected 1908) of Chief Seattle, Tilikum Place, Seattle, Washington. The statue is on the National Register of Historic Places. 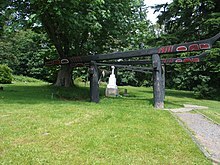 Seattle's grave site is at the Suquamish Tribal Cemetery. 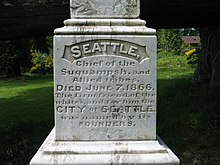 In 1890, a group of Seattle pioneers led by Arthur Armstrong Denny set up a monument over his grave, with the inscription "SEATTLE Chief of the Suqampsh and Allied Tribes, Died June 7, 1866. The Firm Friend of the Whites, and for Him the City of Seattle was Named by Its Founders" On the reverse is the inscription "Baptismal name, Noah Sealth, Age probably 80 years." The site was restored and a native sculpture added in 1976 and again in 2011. Soundgarden, a Seattle rock band, covered the Black Sabbath song, "Into the Void" replacing the lyrics with the words from Chief Seattle's speech. The Suquamish Tribe honors Chief Seattle every year in the third week of August at "Chief Seattle Days". The Evangelical Lutheran Church in America commemorates the life of Seattle on June 7 in its Calendar of Saints. The liturgical color for the day is white. The city of Seattle, and numerous related features, are named after Seattle. A B-17E Flying Fortress, SN# 41-2656 named Chief Seattle, a so-called "presentation aircraft", was funded by bonds purchased by the citizens of Seattle. Flying with the 435th Bombardment Squadron out of Port Moresby, it was lost with its 10-man crew on August 14, 1942. The Chief Sealth Trail is named after Chief Seattle. ^ a b c d e "Chief Si'ahl and His Family". Culture and History. Duwamish Tribe. Retrieved 2009-09-24. ^ a b c d e * Emily Inez Denny (1899). Blazing the Way (reprinted 1984 ed.). Seattle Historical Society. ^ a b Buerge, David M. "Chief Seattle and Chief Joseph: From Indians to Icons". University of Washington. Retrieved 17 August 2017. ^ "History". Quieute Nation. Retrieved 17 August 2017. ^ a b c d e f g h i Gifford, Eli (2015). The Many Speeches of Chief Seattle (Seathl): The Manipulation of the Record on Behalf of Religious Political and Environmental Causes. pp. 38–39. ISBN 978-1-5187-4949-0. ^ "Chief Seattle's Speech". HistoryLink. 2001. Retrieved July 1, 2007. ^ a b c d e Jerry L. Clark, "Thus Spoke Chief Seattle: The Story of An Undocumented Speech", in the US National Archives' Prologue Magazine, Vol. 18, No. 1, Spring 1985. ^ Rudolf Kaiser, "Chief Seattle's Speech(es): American Origins and European Reception", in B. Swann and A. Krupat, eds., Recovering the Word: Essays on Native American Literature (University of California Press, 1987). ^ David Buerge, "Seattle's King Arthur: How Chief Seattle continues to inspire his many admirers to put words in his mouth," in Seattle Weekly, July 17, 1991. ^ a b Malcolm Jones Jr. and Ray Sawhill, "Just Too Good to Be True: another reason to beware of false eco-prophets", Newsweek, May 4, 1992. ^ Furtwangler, Albert (1997). Answering Chief Seattle. University of Washington Press. Retrieved August 31, 2007. ^ Henry A. Smith, "Early Reminiscences. Number Ten. Scraps From a Diary. Chief Seattle – A Gentleman by Instinct – His Native Eloquence. Etc., Etc. ", Seattle Sunday Star, Oct. 29, 1887, p.3. ^ The account of the governor's 1854 visit in The Pioneer states: "We understand the object of his tour is to institute an investigation into the condition of Indian affairs." Governor Stevens himself wrote that the purpose of his visit was "to visit and take consensus of the Indian tribes, learn something of the general character of the Sound and its harbors ... In this trip I visited Steilacoom, Seattle ... We examined the coalmines back of Seattle ... and saw a large body of Indians of nearly all tribes. I was greatly impressed with the importance of Seattle." ^ William S. Abruzzi, The real Chief Seattle was not a spiritual ecologist, The Skeptical Inquirer v.23, no.2, March–April 1999. ^ Nancy Zussy, Brief analysis of the different versions of the speech accessed online on Jan. 30, 2016. ^ Letter from John C. Broderick of the Manuscript Division of the Library of Congress, dated 1 April 1977, in reply to an inquiry by Lennart Norl'en at the Institute Forestal Latinoamericano in Venezuela, dated 20 March 1977, about the authenticity of Chief Seattle's "letter." Transcript at the Seattle Museum of History and Industry, Seattle, Washington. ^ Letter from Richard C. Crawford of the Natural Resources Branch of the Civil Archives Division, National Archives and Records Service, to Lennart Norlen, dated 6 April 1977, in response to Norlen's inquiry as to the authenticity of the "letter." Transcript at the Seattle Museum of History and Industry, Seattle, Washington. Crawford wrote that "our staff has spent considerable time and effort attempting to locate the letter or find some indication that Seattle did write the letter, but have been unable to do so." ... Letter from Richard S. Maxwell of the Natural Resources Branch of the Civil Archives Division, to Janice Krenmayr, Seattle, dated 18 September 1974. (Transcript at The Seattle Museum of History and Industry, Seattle, Washington.) Maxwell stated that there was no letter from Chief Seattle to President Pierce in the Bureau of Indian Affairs. Krenmayr also checked with the archives of the New Hampshire Historical Society, the Manuscript Division of the Library of Congress, and Bowdoin College, none of which had a record of the letter. ... Letter from Richard Crawford of the Natural Resources Branch of the Civil Archives Division, to Jodi Perlman-Cohen of Littleton, Colorado, dated 17 August 1976. ... Letter from Richard Crawford of the Natural Resources Branch of the Civil Archives Division, to E. Nolan of the Seattle Historical Society, dated 2 November 1976, in response to Nolan's inquiry as to the authenticity of the "letter." Transcript at the Museum of History and Industry, Seattle, Washington. ^ "Suquamish Culture". Suquamish Tribe. Retrieved July 1, 2007. ^ "Chief Seattle" and Crew. Retrieved December 27, 2008. ^ * Gene Eric Salecker (2001). Fortress Against the Sun bob. Da Capo Press. 978-1580970495. ^ "Chief Sealth Trail". Retrieved February 12, 2012. Lakw'alas (Thomas R. Speer), The Life of Seattle, 'Chief Seattle', Duwamish Tribal Services board of directors, for the Duwamish Tribe, July 22, 2004. Jefferson, Warren (2001). The World of Chief Seattle, How Can One Sell the Air?. Summertown, TN: Native Voices. p. 127. ISBN 1-57067-095-1. Fox, Emily (December 11, 2017). 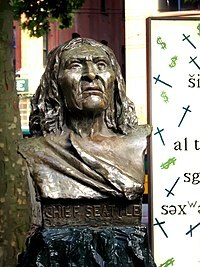 "A rare move by Chief Seattle changed the future of the city". KUOW Puget Sound Public Radio. KUOW-FM. 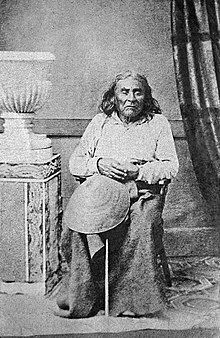 Wikimedia Commons has media related to Chief Seattle. "Seattle" . Appletons' Cyclopædia of American Biography. 1900.